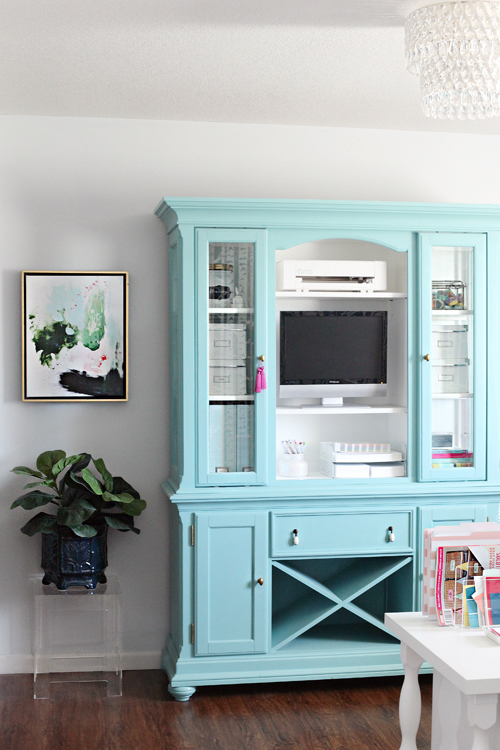 That said, you all know me well enough that we do try to combine both high and low storage throughout our home, and that we generally go through a checklist of options with any project we tackle. When I moved my office earlier this year, things sort of just landed and I have slowly been finding more permanent solutions as I settle in. My camera is a huge part of me and my life, both for work and for family. I use it every. single. day. And over the last 7+ years of blogging, my gear collection has continued to grow. I love how pictures do such a great job of telling a story and adding to the content I share here, and I also find joy in photographing my family and travels for our photo books and walls. The majority of my equipment has been living in my camera tote on the floor next to my desk, while the remainder was in a few other drawers and boxes. Not only would I look in multiple places any time I needed to tether to my computer or use my tripod, but my camera bag really isn't a great long term solution for protecting my investment pieces. 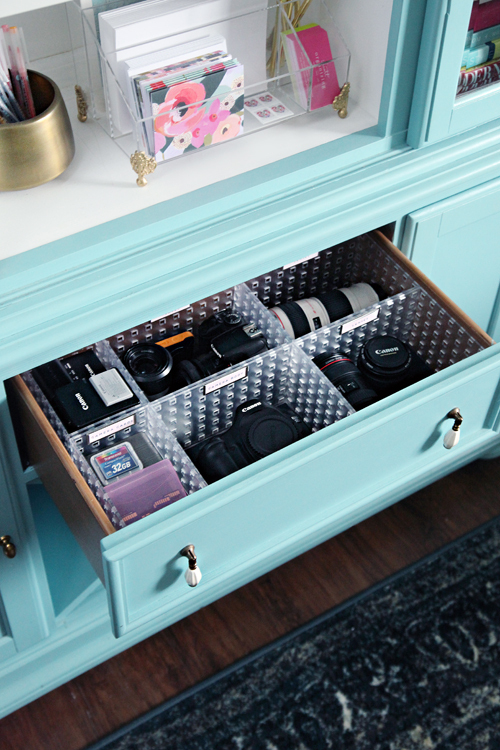 I had thought about how I wanted to store my photography items for a long time, considering everything from decorative boxes to stackable drawers... until one day it sort of just hit me that I already had the perfect drawer waiting to be put to good use. The large drawer in my storage hutch had become my office junk drawer, yet really wasn't adding a lot of value. 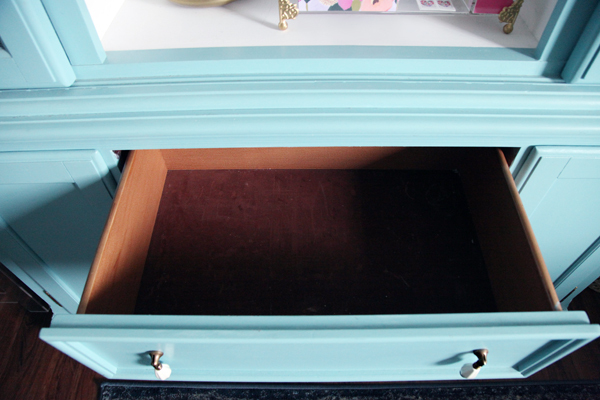 But the drawer itself is amazing because it is large (deep and tall) and very sturdy. 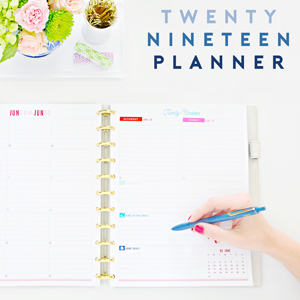 It didn't take long for me to pull everything out and give myself a blank slate to start with. This was the point in which I started to consider my options for the gear. I wrote down the drawer measurements and began doing a little online shopping. The goal was to make the most of the space, while also keeping my gear separated and protected. 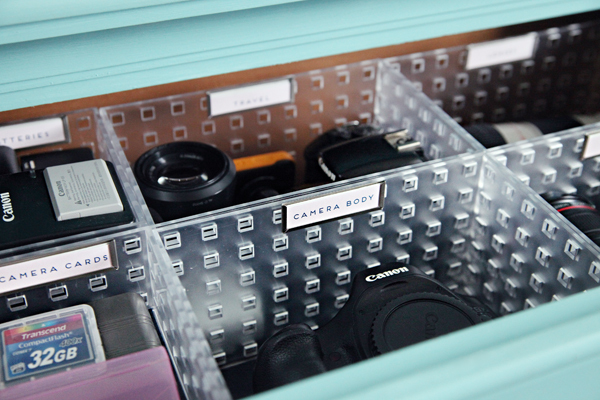 I found myself hitting roadblocks in all of my searching, until I spotted the Bricks system from The Container Store. Initially I wasn't sold on them, primarily because they were on the pricey side, but I continued to return to the solution over and over. I took a trip to the store to play with them in person, and they made me feel like a kid again. They stack and create endless options, and before I knew it I was playing my own real life game of Tetris right in the aisles. After spending some time with these organizers, I could tell that they were high in quality and that they would take good care of my gear. Measurements in hand, I put together a combination that would hold all of my specific categories: Lenses, Body, Travel Cameras, Batteries/Chargers, Camera Cards/Reader, Cleaners/Cloths and Misc Accessories. Once I had the Bricks back home, I wanted to add a little extra protection to the organizers before storing my equipment. 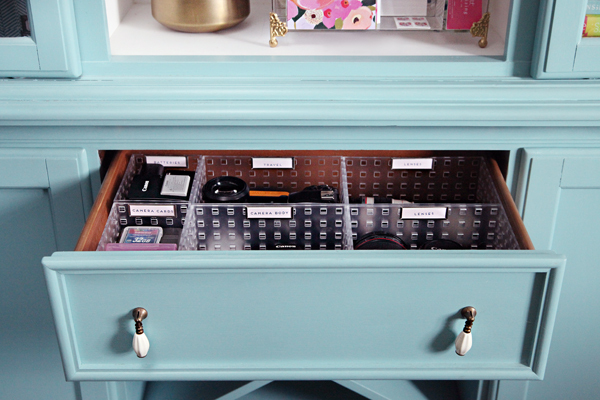 Each drawer was lined with some inexpensive felt from the craft store. 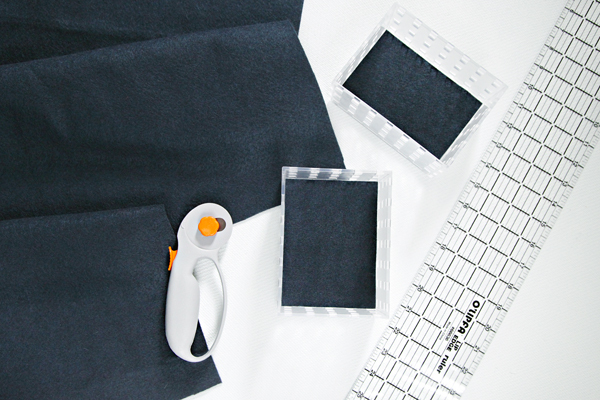 It worked best to use a rotary cutter and straight edge ruler to achieve nice and straight felt edges. The Bricks system has label holders that work specifically with the bins, but I wanted to give these adhesive label holders a try. I have been looking for a good alternative to my favorite Martha Stewart Bookplate label holders, and these seemed like a really good option. I measured the label holder insert and used the measurement to create some simple labels in Pages. Pink and navy because it is currently my favorite color combo! I have to say, these little label holders will be popping up all over our home going forward. I am ridiculously in LOVE! I stuck a label to the back of each organizer and filled each box accordingly. This is seriously my favorite part of any process. Putting everything away nice and neat and knowing that I just solved a long time problem. 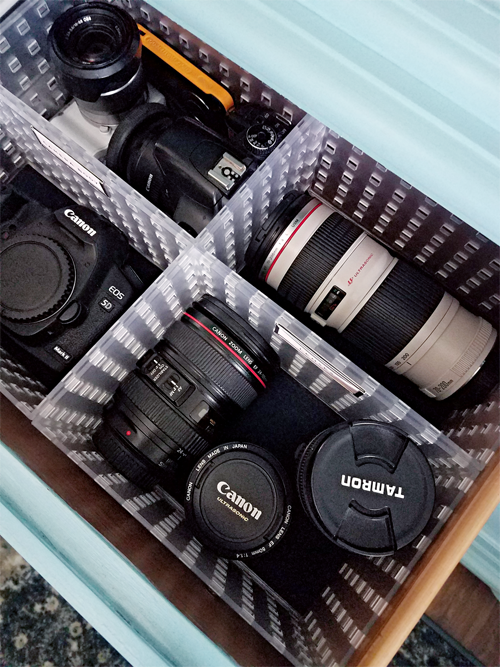 Camera gear is an expensive investment and now I can breath easier knowing that my items are tucked away safe and sound. It will be easier to find all of my accessories for blog photography and also a breeze to pack up when traveling. 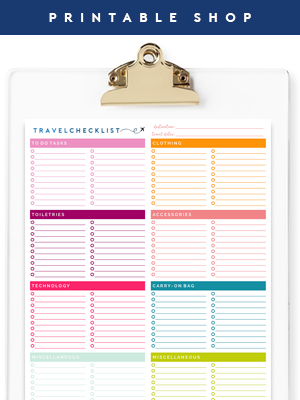 I know that many of you are not photographers or bloggers and this post may not seem relevant, but the great thing is that these organizers can be used for endless purposes, and they don't even need to live inside of drawers. 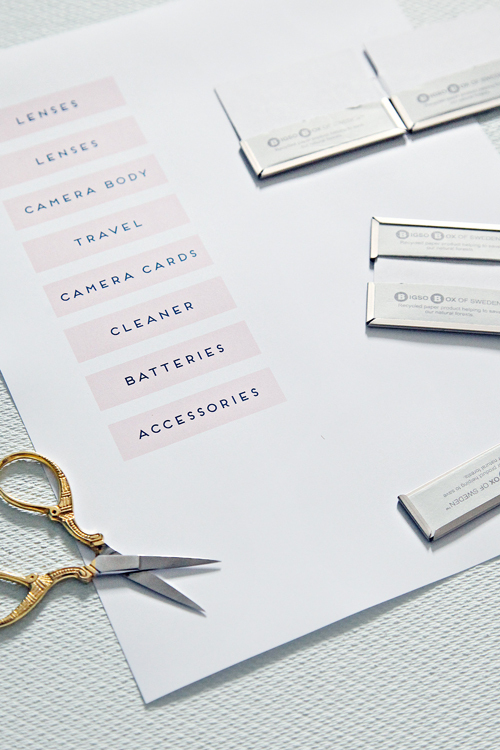 And if anything, now you know that there are really amazing adhesive label holders on the market that will change your labeling life. And if you are like me, just the sight of an organized drawer is enough to make you feel warm and fuzzy for the day! We will be hosting friends and family in our home tomorrow for Thanksgiving, but I also want to let you all know how thankful I am for you. I welcome you all into our lives on a daily basis and I am so lucky to have you all here as we organize and renovate our way through our home. I hope you all have a warm and safe holiday and that you know my gratitude for you is endless. 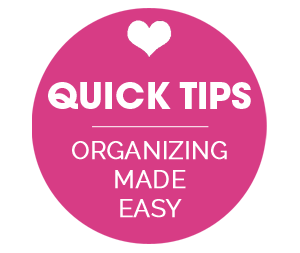 I heart organizing too! Never commented before but used these Like It components to organize the drawers in my dental office. My assistant and I feel the drawers work so much better than before. 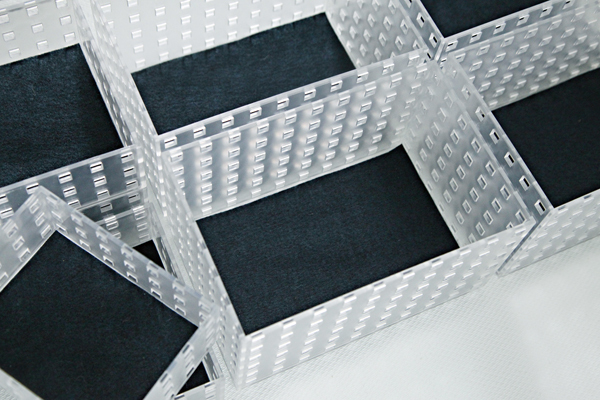 These Like It pieces come in so many sizes which allow you a multitude of configurations. I don't live near a store and had to mail order but that was ok. I can see many uses for them at home! Love this post even if it doesn't relate at all to my life! We organizing aficionados are weird like that! Thank you!! ☺️ I understand the stumbling on good settings, it took me a long while to grasp a dslr and manual settings. I wrote a post all about my photography learnings and tips here: http://www.iheartorganizing.com/2014/11/iheart-blogging-series-photography-tips.html. Biggest piece of advice is to just set aside some time to photograph the same thing over and over while changing your settings and seeing how those settings change your image. Best of luck to you! I loved this! Who knew such a thing existed?! 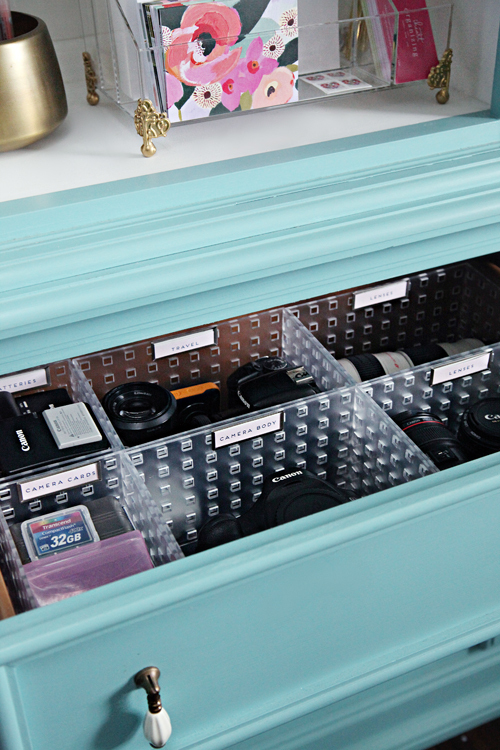 Do you have a post on the stationary organizer on the shelf above the drawer? I finally found a really good online course that was easy to understand, affordable and let me dive in when time allowed. Mom life! Hope this (affiliate link) helps: http://shultzphotoschool.refr.cc/VBDHGKM Jen, this post is perfect timing. I was just lamenting how much I hated storing things in my camera bag last night and then I saw this on Instagram. Thank you! I loved this post! 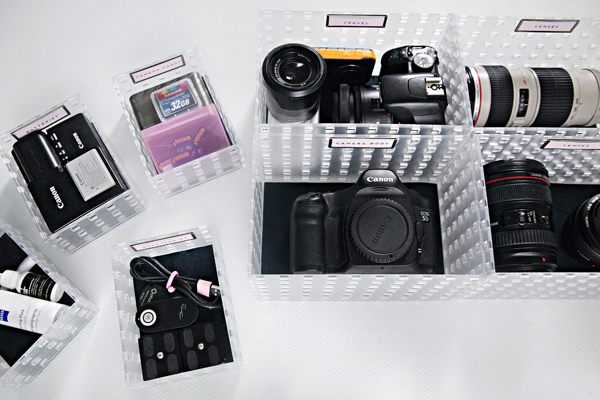 I am a photographer and have been struggling with storage solutions for my cameras and lenses for a while now. Will definitely be putting some of your solutions to use! 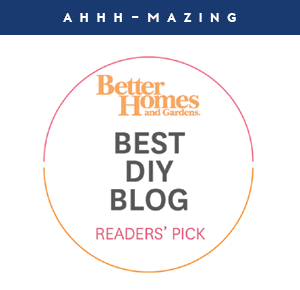 I've followed your blog for years now - it's my favorite! Awesome post! what color is that on the hutch? The hutch is painted in Sherwin Williams Reflecting Pool. LOVE! My fiancé and I own a wedding photography business AND our wedding colours are pink and navy... how perfectly charming! I am super excited! These bins are what I've been searching for to use in a couple of really deep kitchen drawers. Everything get's lost in there, and stacking/sliding bins would be perfect! Where is that clear desk organizer with gold feet from? I love it! 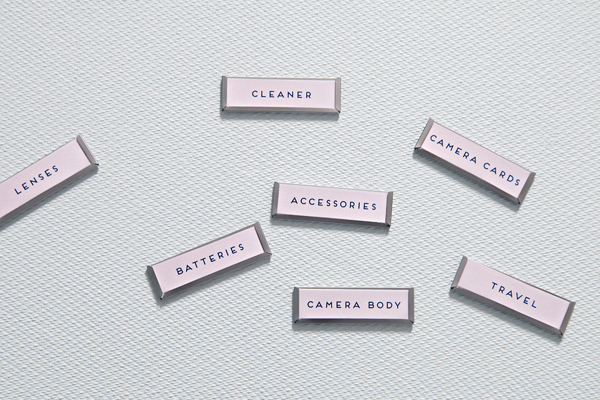 I've often wondered where other bloggers keep their camera. Mine chills in the pantry...high enough to keep it from the little hands but close enough to be accessible...but not a great long term solution either. Happy Thanksgiving to you from Costa Rica. Thank you for your great and creative ideas !!! Hi Jen! I've been searching for the perfect camera bag for ages and continue to use the free (and awful) bag that came with the bundle. 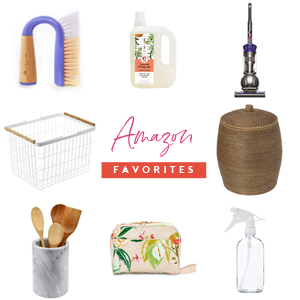 Are you elated with your bag (I love the look, btw) enough that you'd never want another one or have you seen more functional ones out there? I have been gifted a couple of different JoTote bags over the years and I love each one so very much! They are just wonderful for protecting my gear, holding a few extra items (so many pockets) and they are also quite stylish. :D I am a huge fan! Awesome! It's on my wish list for this year! Thanks! Awesome! Thanks for the tip. Here's something to add. 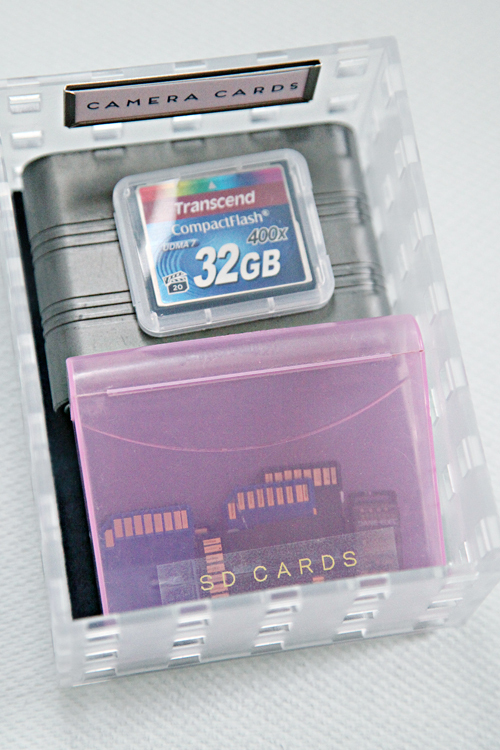 It's better to use bright colored felts you can easily see small items like SD cards, etc. I have plenty of Kata bags and I like their bright yellow interiors for that reason.